Watching your home burned down or being a flood victim is extremely difficult. All of those memories, all of your things, everything, are gone in a split second. Inspection: The first step of the process is inspecting the damage. We will determine what is salvable and what we are able to repair. This will help us come up with a plan and a cost estimate for you. Depending on the damage that was done, we may need to replace some of the stone in your property because an extensive damage cannot be brought back. However, we can restore most of your stone work without a doubt. Repairs: Once we have inspected the damage and determined our plan of action, we will begin the repairs. 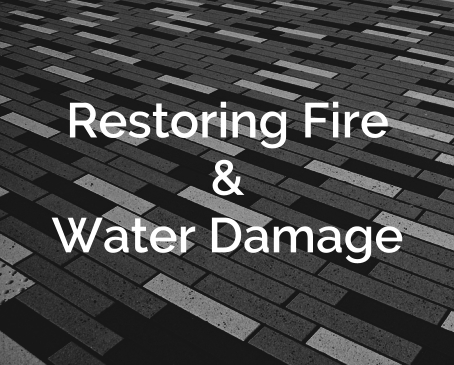 Repairing fire and water damage stone work can be a challenge. However, we are able to bring the stone back to its original condition through the use of various special processes and chemical based compounds. These are applied to the stone, which will deep clean the surface that will restore the original look of the stone. Replacement: Stone is extremely difficult to damage but there are occasions when they could form cracks due to the fire or the water. If these cracks are deep enough, they may not be repairable. In these cases, we suggest to simply have it replaced with a new piece instead. It can be a travesty situation watching your home get engulfed by flame or swallowed by water, but once the damage has been done, it is possible to restore your home back to its former glory. We are here to help you through every step of the process. If you are interested to learn more about our services and what we are able to do for you, please call us today at 800-750-7866. This entry was posted in Stone Condition, Stone Decoration, Stone Flooring, Stone Restoration and tagged Inspection, Repairs, Replacement, Restoring Fire Damage, Restoring Water Damage. Bookmark the permalink.